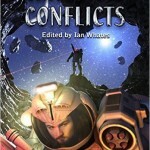 So last week Crises and Conflicts, an anthology celebrating the first 10 years of the superb NewCon Press, was released, along with its companion anthology Now We Are Ten. The last story in Crises and Conflicts is by yours truly and is called the Beauty of Our Weapons (with apologies to Leonard Cohen) and I have to say I’m very pleased with the story. It is set in the same world of the Age of Scorpio trilogy, and contains a number of cameos from a few familiar faces. It tells the story of a technological immortal who is present at a number of turning points in military history connected to weapons development (with the normal: it’s fiction caveat). I was lucky enough that Ian Whates, the owner and editor-in-chief for NewCon, chose BoW as inspiration for the cover art. There is however a problem with the story, it is inspired by a facet of my personality that I am not entirely comfortable with: my fascination with weapons.